With cutting-edge presentations by PR and comms pros from Edelman, Weber Shandwick, Ketchum, NASA, Coty, Diageo, Viacom, PepsiCo and Grayling, the Global PR Summit New York 3 is next year’s most anticipated PR event in the US. From today until December 14th at midnight, every time you purchase a ticket to the Global PR Summit New York 3, you’ll get a second ticket for free. Head here for more info. The Washington Post reported that a Saudi-funded lobbyist paid for 500 rooms at Trump’s hotel after the 2016 election. That piece comes from David Fahrenthold and Jonathan O'Connell. “It made all the sense in the world, when we found out that the Saudis had paid for it,” Ryan McCarthy quoted from the story. Mother Jones reported on documents they’ve seen which apparently point to illegal campaign coordination between Trump and the NRA. Mike Spies is behind that exclusive. The New York Times via Miriam Jordan published a bombshell report yesterday called Making President Trump’s Bed: A Housekeeper Without Papers. “Scoop: an undocumented immigrant from Guatemala has been making President Trump’s bed,” Marc Lacey announced. Meanwhile, BuzzFeed reports that A Mysterious Imposter Account Was Used On Facebook To Drum Up Support For the Migrant Caravan. That piece is the work of Ken Bensinger and Karla Zabludovsky. “The social media giant has since deactivated the account but has refused to provide information about who created it,” Jason Leopold pointed out. An analysis of Rex Tillerson on Trump in the Washington Post included phrases Tillerson used like “Undisciplined,” “doesn’t like to read,” and tries to do illegal things. Aaron Blake seemed to have a field day writing this. Meanwhile, Trump is expected to Pick Heather Nauert as the next UN Ambassador, sources tell Bloomberg News. And William Barr has emerged as the leading attorney general candidate in Trump discussions, Devlin Barrett, Matt Zapotosky, and Josh Dawsey found out for the Washington Post. CNN's New York offices were evacuated overnight due to a bomb threat, Nicole Chavez reported from inside the newsroom. BuzzFeed News' Alex Wickham said that Theresa May’s Team Has Discussed A Second Referendum Or A Softer Brexit If Her Deal Is Killed Next Week. “Amazing. A Number 10 aide has told @alexwickham: "It has come to the point where you feel like you are in that Mitchell and Webb sketch when one of the Nazis looks at the other and asks, ‘Are we the baddies?’" Mark Di Stefano tweeted. In a column at The Guardian, George Monbiot set out to explain How US billionaires are fuelling the hard-right cause in Britain. Monbiot pointed out the piece was “Investigated in collaboration with @DeSmogUK” and that “the Koch Brothers funded a Trotskyite splinter group.” Ian Birrell added that “the Koch brothers have given Spiked $300,000.” “It doesn’t get much weirder or – in my view – darker than this,” Monbiot admitted. Sam Coates at the Times of London wrote of “leaked government documents which reveal Ireland could be hit harder than the U.K. and face food shortages in a ‘no deal’ Brexit.” “Brexiteers demand May warn Leo Varadkar that it’s ‘no backstop or no deal’- Labour attack morally outrageous threat Warning of food shortages in Ireland,” he tweeted. “Someone will be needing the history books out over in Whitehall,” Richard Chambers added. Henry Zeffman’s piece in the Times of London got an exclusive that Ministers will order pharmacists to ration drugs if UK crashes out. “Ministers will have the power to overrule doctors’ prescriptions in case medicines run out after Brexit. Urgent government consultation launched on Tuesday, leaked to The Times,” he tweeted. There’s news in the Washington Post (via Amy Gardner and Beth Reinhard) that Republican officials had early warnings of voting irregularities in North Carolina. Missouri Secretary of State Ashcroft launched an investigation into Josh Hawley according to Jack Suntrup at St. Louis Today. For reference, Hawley is the attorney general and might have "used public funds as Attorney General to support his candidacy for U.S. Senate." At the Washington Post, Lisa Rein saw some emails that show the Veterans Affairs’ diversity chief was told not to condemn white nationalists after Charlottesville. The 61st GRAMMY Awards released their Full Nominees List if mainstream music is something you pay attention to. Dani Deahl thinks “The nominations for best dance album 2019 are SO on point *chef's kiss*” So check that out and get dancing this weekend. CBS had a live stream of the Bush funeral train and services in Houston. AP News reports that Ecuador’s president got enough UK guarantees for Assange to leave the embassy. Yesterday, we asked: What chef just became the first woman in the United States to receive three stars from the Michelin Guide? 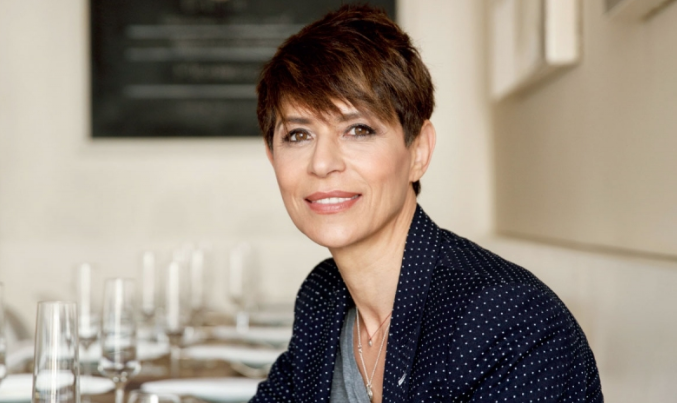 Answer: It’s Dominique Crenn, a French chef and the mastermind behind San Francisco’s Atelier Crenn. Congrats to Dan Rosenbaum for being the first to tweet the correct answer. Your question of the day for today is…Domestic goddess Ina Garten finished up her most recent book tour in LA by visiting what establishment with her good friend Jennifer Garner?